As the sun rose, I sat on a rock pile and contemplated everything. It was October 2014 and I had a good deer in front of me. He was about 300 yards away, easily within range of my .300 WSM. I had opted not to bring my spotting scope and now I was paying for it. Through my binoculars I could tell the buck was wider than his ears but I wasn’t sure of his frame. I looked down at my phone and was surprised to see that I had service. 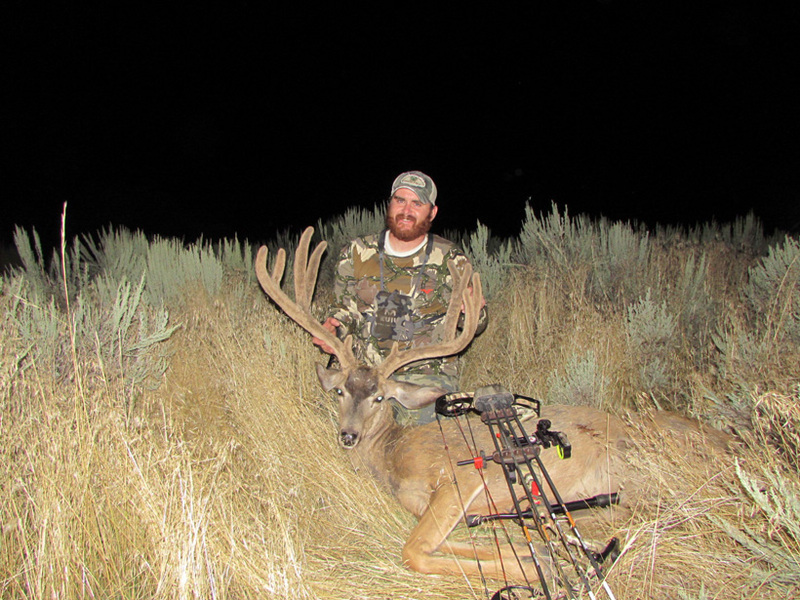 I decided to call my hunting partner, Troy, and talk it over. He answered and told me he was at work and couldn’t talk much. He told me that if I wasn’t sure he was big enough, I had better pass. 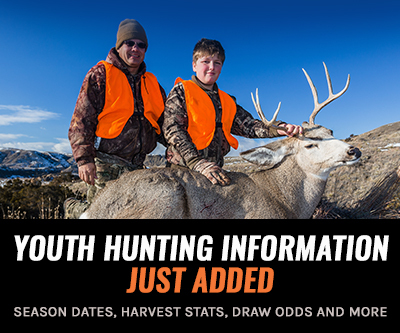 As a member of the Dedicated Hunter program here in Utah I was able to hunt all three seasons, but only allowed to take two deer every three years. This was my first year in the program so I decided to pass. It was tough to watch him feed over the hill, but I was confident it was the right choice. A few months later I got some exciting news. My wife and I found out we were expecting our second child. As soon as I saw that positive test I started calculating. It didn’t take long to figure out that for the second year in a row we would be bringing home a baby right smack in the middle of hunting season. After a huge amount of good natured ribbing from friends and family, I decided that I would just have to hunt within cell phone range and be ready to run back to town. 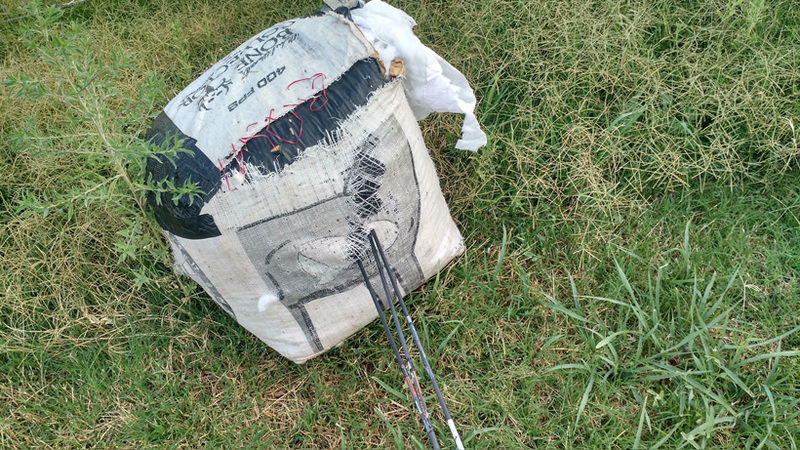 We began our pre-season rituals in late June, shooting bows and preparing gear. We made a couple of trips to the area where we would be hunting and set trail cameras up in early July. We decided to try an area that we had scouted very little in the past. The feed and water were in abundance after such an amazing rainfall year and we were a little worried that the deer would be too spread out. The week before our archery hunt was to begin, Troy made a solo trip to retrieve the cameras so we knew what we were getting into. 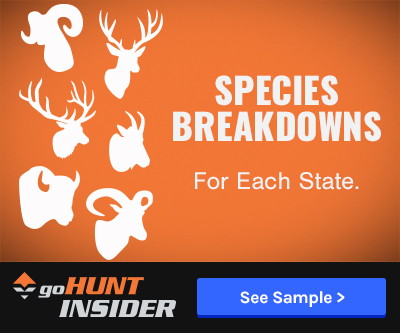 We had several good bucks showing up on our cameras consistently — two of which we considered to be shooters: One wide four point with great mass and another bigger four point with a perfectly symmetrical frame. After thumbing through several thousand pictures we were optimistic of our chances. We were also able to find a few areas with good cell service so that I would be able to keep in touch with my wife. Finally, opening weekend rolled around. I had to work late the night before opening day and didn't get out of town until about 9 p.m. 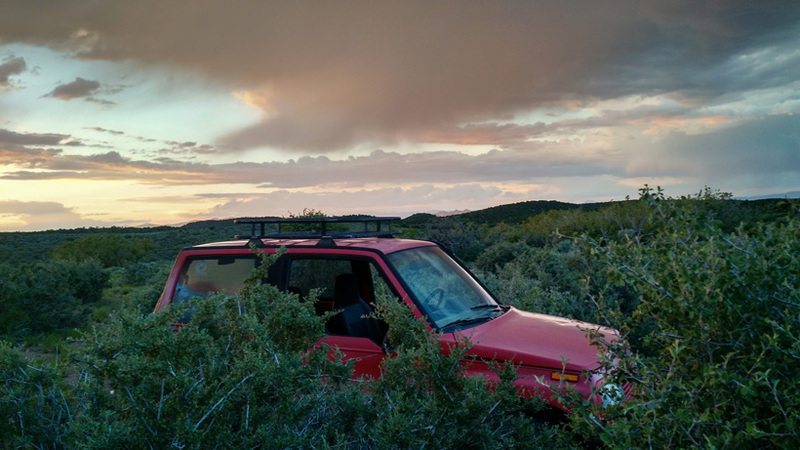 I made the hour drive to the area and then the steep climb solo to our camp. I met Troy in camp and we went to sleep after making plans for the following day. I woke up twice during the night to make the climb to get cell service. I wanted to make sure that the baby wasn't coming, but when 5 a.m. rolled around it was hard to get up. I talked myself into it and headed to where I wanted to be. 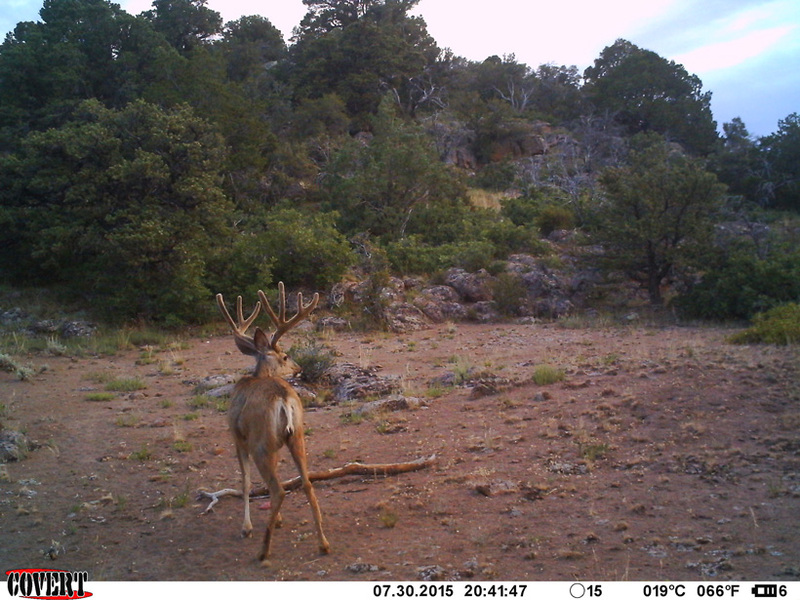 We had set a camera in a high saddle and got a lot of bucks on their way to and from water. I hit the saddle at first light and waited for the bucks to come through. 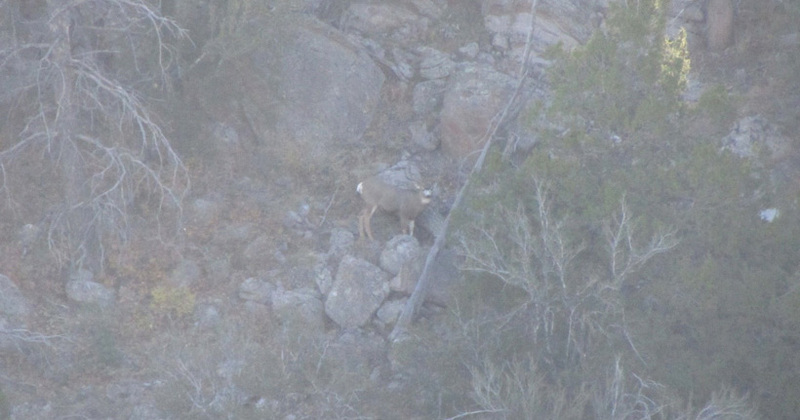 I sat on steep rock all morning only to have one small buck come by at 40 yards. I glassed for a while and turned up some deer but nothing worth getting excited about. I hiked down to meet Troy back at camp. We ate breakfast and waited out the day. The heat was exhausting and the 95+ degrees in the afternoon kept the deer bedded in the shade. We decided that sitting water would be a good option for the evening hunt and around 5 p.m. we made our way to two different water sources to sit. I sat on the lower water and Troy sat the upper. Troy had a solid four point come in, but he was spooked off by another hunter. I had a couple of small bucks come in, but no shooters. I hiked back to camp in the dark and went to bed. Day two started off the same as day one. I dragged myself out of the sleeping bag after a long night of checking my phone. Troy and I decided to hunt the morning together and made our way to the area closer to the upper water. There were some small bucks on the pond, but nothing big enough. We glassed for a while and spotted a group of about ten bucks. 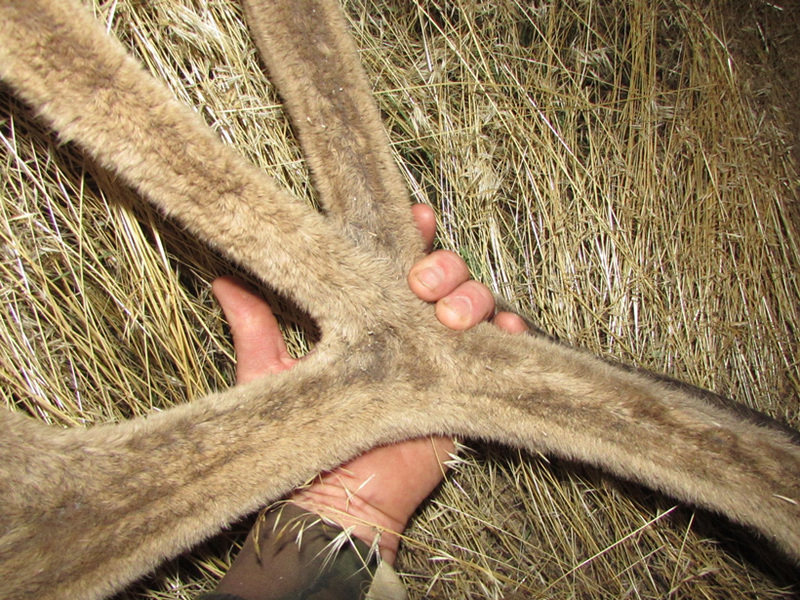 The best buck was a pretty 3x4. He was tall and heavy so we decided to give him a try. Having hunted that ridge many times, we knew there was a small draw that would allow us to sneak below the deer and come up behind them. The wind was good and we made our move. We moved quietly and slowly and within a half hour were in range of the bucks. I could see the tips of their velvet covered antlers as they fed 40 yards below us. The best buck was also the closest to us. I had a clear opening to his vitals and could have shot, but I wanted a better look at him. When he lifted his head, the conflict started in my mind. He was a good deer, but not great. He was about 24” wide and pretty but I couldn’t decide if he was the one. I thought of my wife and how happy she would be to have me home. I thought of the fact that I still had a couple months of hunting left and decided to pass. Eventually the wind swirled and the bucks trotted down the hill. We made our way back to camp to wait out the heat. The temperatures were borderline unbearable. Even in the shade there was no relief. 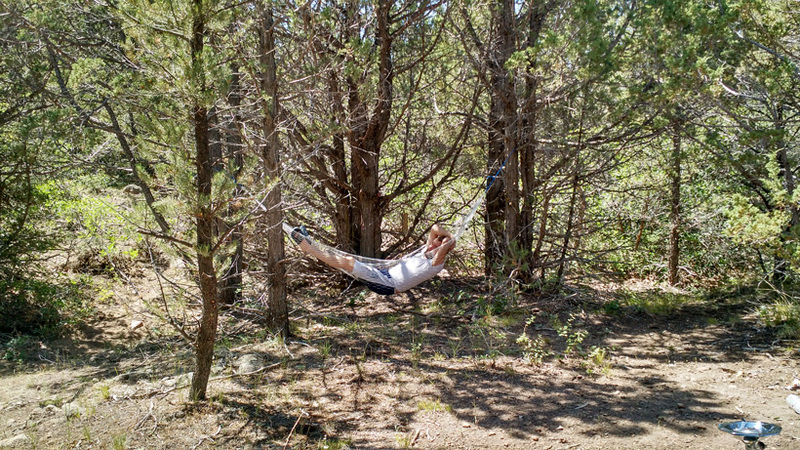 Luckily, we had plenty of water and we had our hammocks to relax in so we were as comfortable as we could be. As we sat and discussed our plans for the evening one thing became clear: if we were hot that meant the bucks were, too. 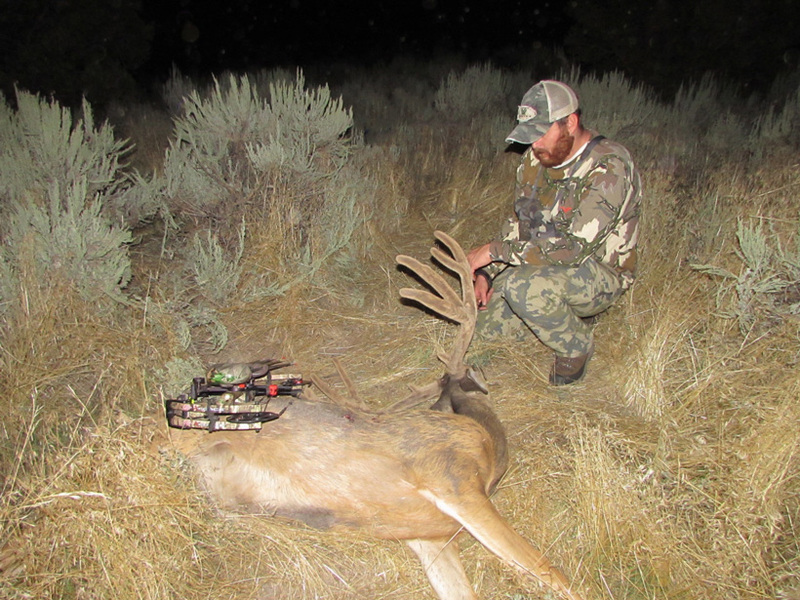 As the temperature climbed, we knew that the odds of the better bucks getting thirsty and making a mistake increased. When the late afternoon rolled around, Troy and I parted ways. I headed once again to the lower water while he moved towards the upper. Once I arrived at the water, I was surprised to see several does and a small buck already drinking from the pond. I snuck into my blind and settled in for what promised to be an exciting evening. Yet, as the hours passed, only a few does and smaller bucks came to drink. With the sun sinking low and setting I began to question my hunch. I heard a noise behind me and turned to see a two point and a doe standing 10’ away. I pulled out my phone and took a few pictures of the deer. I tossed a small rock and bounced it off the side of the little buck. He didn't even flinch. I returned my attention to the pond and there he was. My heart instantly began pounding in my ears. He looked my direction and I knew right away he was a shooter. 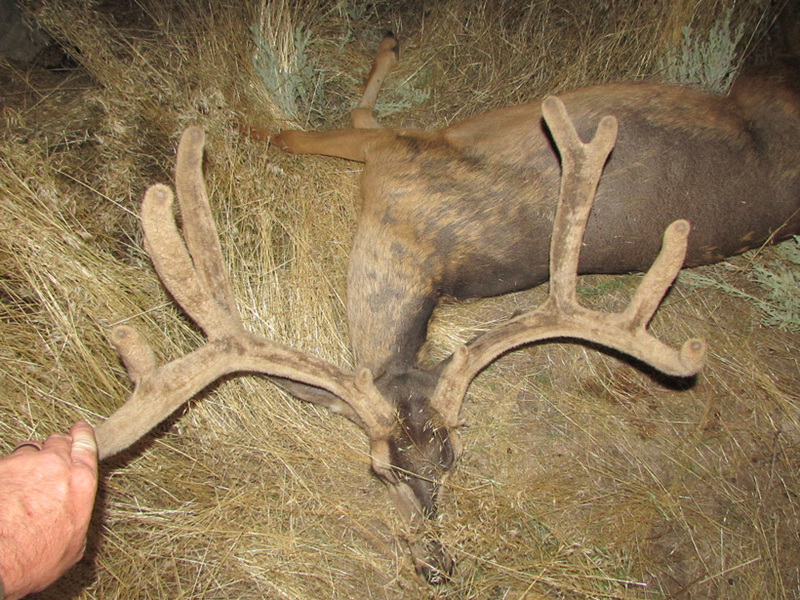 His heavy velvet covered antlers were much wider than his ears. About this time a doe at the water winded me and snorted loudly. He looked at her like she was crazy and headed straight for the pond. I ranged him at 40 yards as he began to drink. He was slightly quarted to me as I stood and drew my bow. My yellow pin settled on his heart and I hit the release. Smack! The buck jumped straight in the air and ran for the tree line. I watched as he stumbled before climbing a small hill. As soon as he made it to the top he wheeled and headed straight back down. He ran right at me and ended up crashing about 50 yards from where I shot him. The whole thing took less than 30 seconds and it was done. I decided to make my way over to him before the daylight was completely gone. He lay tangled in the sage and grass. 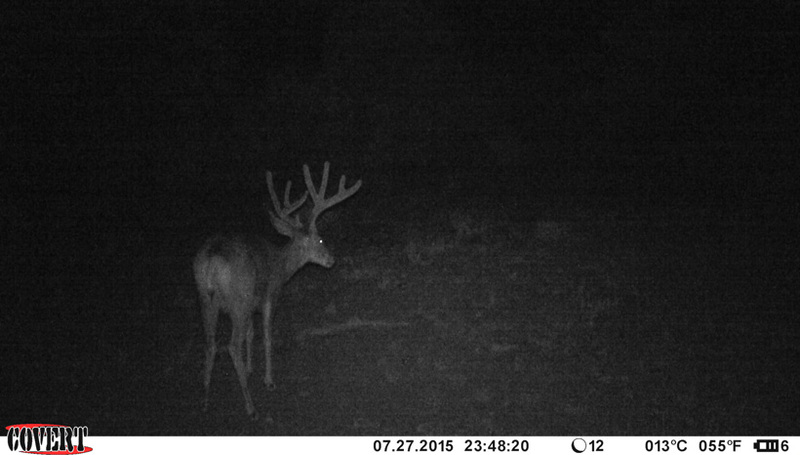 When I pulled his head up I recognized him as one of the two bucks from our camera that we had deemed shooters. I sat in stunned silence and took in the moment. 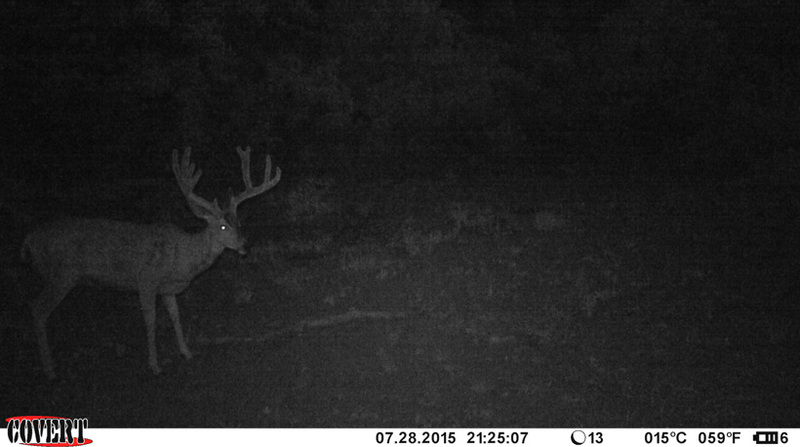 In our years of scouting, this was the first deer from our cameras we had been able to find and kill. He had four points per side plus eye guards and excellent mass. His beams were long and swooped outwards. I tried to guess score and decided I didn't care. He was big and pretty, and that was enough. I called Troy on the radio and he came and met me. We took some pictures and admired him some more. With the heat we decided to head out immediately. We quartered him, loaded him on our backs and headed for camp. We retrieved our camping gear and headed for the vehicles. 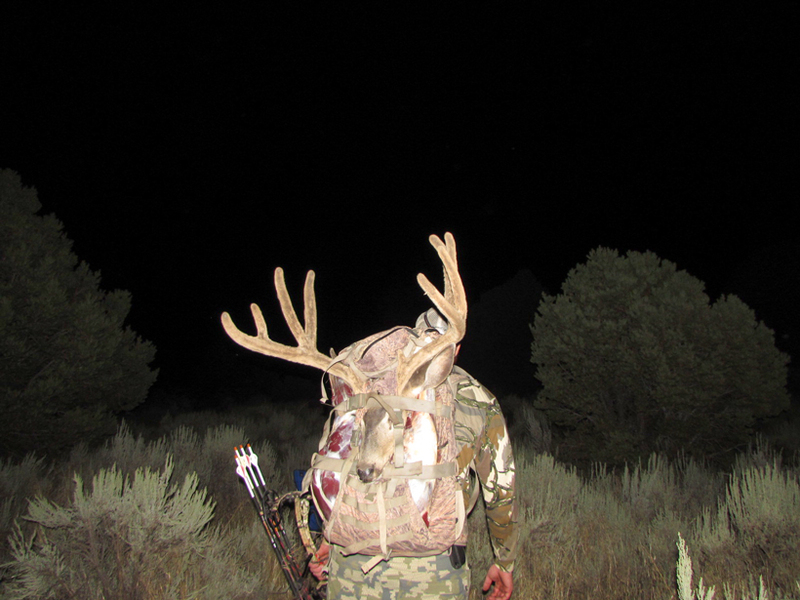 I don't know how heavy our packs were, but between the deer and our gear it was plenty. We made it out around 3 a.m. I drove home and crawled into bed around 5 a.m. I got up early the next morning and took the head to Travis Roundy to preserve the velvet and do a mount. We put a tape on him and came up with 175 ⅞” gross. To me, it was icing on the cake. Score only matters a little bit. What matters most to me is that I have people in my life that make it possible to do what I love. A wife who will stay home with our one year old while eight months pregnant, a friend who will load a heavy pack and carry it several miles with a smile on his face and a creator who knows what I need to be happy and provides me the means to do it. 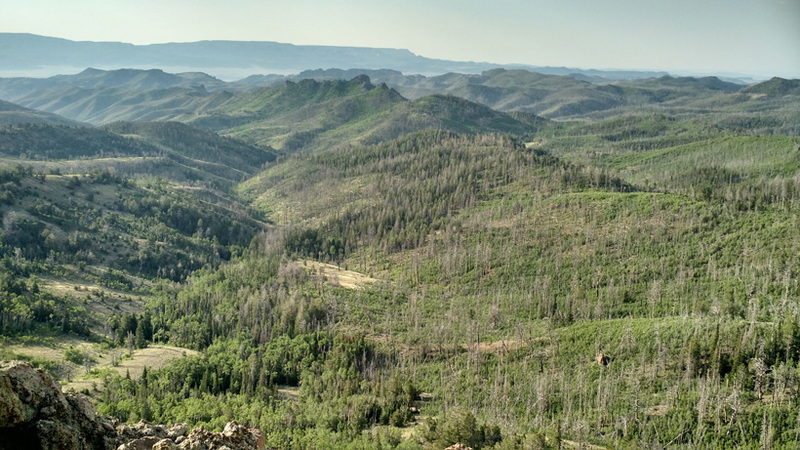 To me, hunting is about moments that make you feel alive — moments where time seems to stop and the whole world revolves around a little place in the backcountry. It's about starry nights and early mornings and time spent with good people. The deer in the end is just the reason to do it; the reason to push harder and the reward for being half crazy.